Raúl Castro was officially designated Fidel’s successor at the Cuban Communist Party V Congress in October 1997. He has indicated that a collective leadership would most likely govern Cuba following his brother’s death. Fidel Castro in July 2006 temporarily ceded power to his brother Raúl and appointed a provisional government responsible for succession issues. The members of the key committee are Carlos Lage Dávila, Felipe Pérez Roque, José Ramón Machado Ventura, José Balaguer Cabrera, Francisco Soberón Valdés and Esteban Lazo. The Revolutionary Armed Forces (FAR) have laid the foundation for a stable restructuring and continuity of the regime: “Raulismo represents a model that consists of stability through peaceful leadership change and reform of the economy” (Mora, 2004). As head of the FAR, Raúl Castro has played a central role in Cuba’s recent history, and has emerged as a “key figure in his own right who enjoys the strong support and loyalty of top military officers,” generals like Abelardo Colomé Ibarra, Pedro Miret Prieto, Ulises Rosales del Toro, Julio Casas Regueiro. and Alvaro López Miera, who is the Army Chief of Staff (Latell, 2006). The possibility lingers that Raúl, who is 76 years old, might be the first to leave the Cuban stage. General Abelardo Colomé is the most likely successor to Raúl as Defense Minister. Colomé is a major power broker within the Cuban Government and is second only to the Castro brothers in terms of the institutions that he commands. Colomé emerged as Minister of the Interior in 1989, following the trial that resulted in the execution of General Arnaldo Ochoa. He led Cuba’s FAR in Angola and has been honored as “Hero of the Republic of Cuba” (Wong-Diaz, 2006). Raúl has played a key role in organizing the structures of the Cuban Communist Party (PCC). In April 2001, he reiterated the authority of the Party “which is the only thing that can guarantee continuity, the unity of the Nation.” To Raúl, loyalty is considered a necessary prerequisite for management of the enterprises owned by Cuba’s armed forces, the leading economic powerbroker on the island. “The FAR, the foundation of Raul Castro’s power and prestige has been central to the process of economic reform and modernization helping the regime not only weather the storm of the ‘Special Period’ but secure a post Fidel Cuba with Raul at the helm” (Mora, 2004). Carlos Lage who has served in a “prime ministerial role” with a more visible policy presence than any of the other top members of the government, frequently visits and negotiates cooperation agreements with other countries and plays a key role in formulating economic policy ( Erikson, 2005). He and Raúl Castro were responsible for many of the “economic reforms” that helped to partially revive the failing Cuban economy in the mid 1990’s. “Cuba’s high water mark with respect to economic policy experimentation and reform was the early 1990s, when several initiatives that promoted a modicum of economic liberalization were put in place” (Pérez-López, 2003). The recent exposés in the Cuban media during Raúl’s interim leadership of rampant corruption and criticism of shortages of food, transportation and housing have hinted of an internal review of Cuba’s political and economic system. Yet the recuperation of the Comandante, the recent meeting with Chinese Communist Party Politburo member Wu Guanzheng, Vietnamese officials, and Angola’s President Dos Santos, the editorials penned under the title of “Reflections of the Commander in Chief” in Granma and Juventud Rebelde, are merely the latest in a series of recent events that suggest that Fidel Castro has returned to the policy making arena. Pérez-López (2003) has summarized the basic ingredients of corruption in Cuba as follows: “The ruling party itself is often the locus of corruption, as the top leadership is normally immune to exposés and reprisals from below, and can engage in self-serving behavior.” The “new class” (Djilas, 1957), or the nomenklatura as the ruling class has been referred to, “was typically able to draw on the resources of the state and to treat socialist property as its own.” The political elite in Cuba as in the former Soviet Union and other Socialist countries “has a system of special perquisites for the nomenklatura whose members are referred to in the island as pinchos, pinchos grandes, or mayimbes. Fidel’s death could precipitate a destabilizing crisis in Cuba’s ruling elite. The judgment offered by the Intelligence Community Assessment is that the “Key drivers in influencing events in Post Fidel Cuba will be elite cohesion in the absence of Cuba’s iconic leader and Raul Castro’s ability to manage what we assume to be high public expectations for improved living conditions” (Fingar, 2007). Any efforts to contemplate a future succession process must consider the members of the key committee responsible for succession issues, the military elite, and powerbrokers in the leadership like Ramiro Valdés, Ricardo Alarcón, and Juan Almeida. Cuba’s new geo-political situation presents it with some major advantages and there is no discernible divide in the political or military elite, “one does not find the kind of institutional cleavages that would threaten the cohesion of the armed forces nor is there reason to believe that the armed forces deviate from the civilian leadership on fundamental issues of domestic and foreign policy” (del Aguila, 1998). 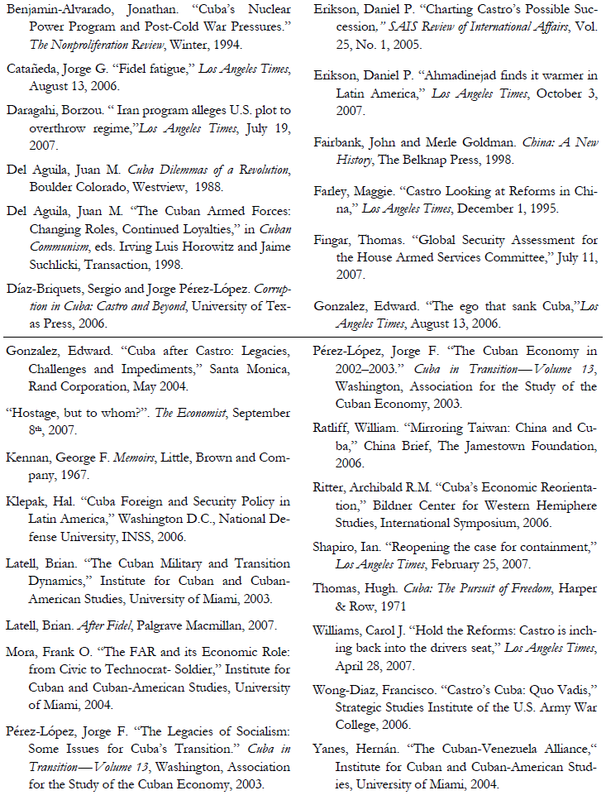 In May 2004, the Bush Administration released a major report of a commission (the Commission for Assistance to a Free Cuba, CAFC), chaired by Secretary of State Colin Powell, arguing that the Cuban leadership “is making preparations to manage a succession of the regime that will keep the senior leadership in power.” The report outlined new measures intended to hasten a political transition in Cuba. The requirements for the United States to lift sanctions requires that both Fidel and Raúl be out of power and multi- Party elections are held in Cuba. The old U.S. policy of containment is not obsolete. Recall that under National Security Decision Directive NSDD-75, U.S. policy called for stimulating “internal pressure on the U.S.S.R. to weaken the sources of Soviet Imperialism.” Some of the proposals in the CAFC report to hasten Cuba’s transition, coupled with President George W. Bush’s recent visits to Brazil, Uruguay, Colombia and Guatemala signal a “reopening of the old containment policy” with an emphasis on democratic values, human rights, trade and diplomacy (Shapiro, 2007). Venezuela and China have emerged as key actors in Cuba’s foreign policy and economic recovery. According to the National Intelligence estimate of July 11, Venezuela’s President Hugo Chávez “is among the most stridently anti-American leaders anywhere in the world and will continue to try to undercut U.S. influence in Venezuela, the rest of Latin America and elsewhere internationally” (Fingar, 2007). Fidel’s Messianic ambitions to strengthen Cuba’s economic, military and political ties with Latin America appear to be coming to fruition in the Agreement for the Application of the Bolivarian Alternative for the Peoples of Our America (ALBA). ALBA has allowed Cuba to increase its sphere of influence in Latin America. Presidents Chávez, Fidel Castro and Evo Morales of Bolivia on April 29, 2006 signed a Trade Agreement that “calls for cooperation and integration between the three countries in health, trade, technological transfer, joint ventures, energy, culture and sports” (Ritter, 2006). Fidel sees Venezuela’s economic support as indispensable to avoid a democratic transition in Cuba. Hugo Chávez’s strategic alliance with Cuba has enabled the Cuban Revolution to forge a military alliance with Venezuela. Venezuela has purchased millions of dollars in weapons primarily from Russia. “The combined Venezuela/Cuban Air Force now with new spare parts makes this a potentially destabilizing force in Latin America. The MIG 29’s are a force to contend in a regional conflict” (Yanes, 2004). The U.S. State Department has voiced serious concerns about the security problems posed to the Western Hemisphere by the increasingly close relationship between Cuba and Venezuela. The Country Reports on Terrorism for 2005 list Cuba as a “rogue” state, a “state sponsor of terrorism” and state that Venezuela has virtually ceased its cooperation in the global war on terror and has remained unwilling or unable to control the traffic of arms, supplies, and drugs across the Colombian border. The Colombian guerrillas were behind nearly a third of 23,144 kidnappings in that country between 1996 and 2006, according to “Pais Libre,” a group that helps the families of kidnap victims. They held 45 people for up to ten years because they consider them canjeable (swappable). France’s president Nicolas Sarkozy, has made obtaining the release of Ingrid Betancourt, a politician of dual Franco-Colombian nationality, a priority. At his behest, Colombias’s president Alvaro Uribe in June freed Rodrigo Granda, the highest-ranking guerrilla prisoner, who promptly decamped to Cuba” (The Economist, September, 2007). Thomas Fingar in his presentation before the House Armed Services Committee was joined by John Kringer, Director for Intelligence (CIA) and Robert Cardillo, Deputy Director for Analyses (DIA). The Intelligence Community (IC) Assessment “Statement for the Record” of July 11, 2007 is that “Cuba remains Venezuela’s closest ally. Chávez has purchased modern military equipment from Russia, including 24 SU-30 multi-role fighters, which can perform air to air, strike, and anti-ship roles and is moving toward upgrading other force projection capabilities. These weapons purchases increasingly worry his neighbors and could fuel defense spending by his neighbors”(Fingar, 2007). China has become a major trading partner, and has provided “credits for the purchase of trains and buses and it is investing $500 million in nickel extraction and refining for importation into China.” The Chinese plan to “invest $800 million to $1,000 million to refurbish and complete the old refinery in Cienfuegos” (Ritter, 2006). China is buying Cuban sugar and investing in petroleum exploration in Cuba’s North West coast, where recent petroleum discoveries provide indications of substantial reserves. The U.S. Geological Survey has estimated that the North Cuba basin could contain some 4.6 billion barrels of oil, with a high-end potential of 9.3 billion barrels. Most significantly, China and Cuba “changed the basis of their trade from barter to cash,” after Cuba was not able to deliver all of the 400,000 tons of sugar it promised in exchange for machinery in 1994 (Farley, 1995). “Mao left China in an economic crisis when he died in 1976. One of these years Fidel Castro will do the same thing in Cuba” (Ratliff, 2006). In China, the post-Mao era combined the move to a market economy with the existing Leninist Party State. Deng Xiaoping’s program and bold reforms ended the political chaos and economic stagnation of the Chairman Mao years and enabled China’s unprecedented economic growth. Deng had the support of the Party’s rank and file in their efforts to abandon Maoist policies. “They rejected not only his utopian visions of an egalitarian society but also the Stalinist model of State control of the economy.” The stress of unending class struggle was abandoned in favor of consensus and economic development. During the post-Mao era, China’s economy underwent a massive transition from command to a market economy (Fairbank and Goldman, 1998). In the international arena, the United States is bogged down in Iraq and Afghanistan. The Middle East is starting to look like the old Cold War; the confrontation with Iran has a familiar look; at stake is political, economic, military and cultural control over the volatile area. President Bush has dubbed Iran a member of the “axis of evil” and has openly sought “regime change” in Tehran, while Ahmadinejad has defied the West with nuclear proliferation. Both sides remain far apart on many issues, and the U.S. has positioned two aircraft carrier groups within 10 miles of Iran’s shores. On the espionage front, the Iranians have detained visiting Iranian-American scholars and charged them with endangering its national security. The Iranian Intelligence Ministry accuses the scholars of trying to create a “soft revolution” in Iran intended to topple the hard line Islamic Regime. Iranians with dual nationality, especially those with links to organizations that promote democracy and civil society in Iran, have been caught in a government crackdown on dissidents, labor activists, women rights groups, and the media (Daragahi, 2007). Venezuela and Iran have been strengthening ties and recently signed 14 new cooperation agreements, adding to 164 existing accords. The boost given to these relations came in the context of a visit to Iran by Hugo Chávez in July 1, 2007 as part of an “international tour that included Russia.” The agreements reportedly include joint enterprises for oil exploration, food processing, trade, heavy machinery production and bicycles. The Iranian Minister of Industry said that both governments are supporting an anti-hegemonic line of work with great political and economic determination. For his part Venezuelan Minister José Salaman described Chávez’s visit as “extremely important and strategic” beyond trade and economic matters. “Iran’s strategy is clear at loggerheads with the Bush administration over its nuclear program, the Iranian government is making an ambitious diplomatic effort to create new allies in Latin America, the traditional U.S. sphere of influence.” While diplomatic relations have intensified, the economic foundation remains thin. “Iran claims the deals are worth $20 billion, but their bilateral trade in the last fiscal year stood at only $16 million, according to the International Monetary Fund” (Erikson, 2007). In light of recent developments, it is likely that no fundamental political change will take place in Cuba as long as Fidel is alive. Cuba’s one party political system will not change in a fundamental way because Fidel and Raul are not willing to tolerate any organized political opposition and the party and the armed forces have the strongest interest in preserving the status quo. Cuba is a police state where freedom of expression and association, and the right to form political organizations, is suppressed and criminalized under the penal code. The political system is organized along Leninist lines as a one-party Communist State. Only small-scale political reforms, such as carefully limited provincial elections, would be permitted and only as long as they do not disturb the one-party monopoly on power. Fidel is in the way of changes and there is no discernible divide in the Cuban political or military elite. Cuba’s ruling elite has shown little inclination to challenge the system the way Eastern Europeans did. Venezuelan economic support has enabled the Castro brothers to recentralize political and economic control and avoid a transition to democracy in Cuba.